Dr. Lori Daniels has worked for two main organizations in her social work career: the Dept of Veterans Affairs (VA) and HPU. She earned her MSW from the University of Chicago (1987) and her Ph.D. in Social Welfare from the University of Hawaii – Manoa (2002). Her clinical practice treating traumatic stress among veterans spans over 20 years. 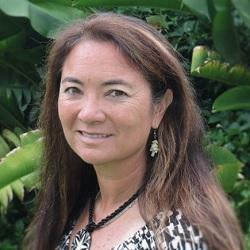 An LCSW for both Oregon and Hawaii, her background includes working for inpatient and outpatient VA hospital-based PTSD programs; as the Director of the Traumatic Stress Recovery Program for the Honolulu VAM&ROC; being a VA/Hartford Geriatric Social Work Scholar; and working as the military sexual trauma psychotherapist for the Portland Vet Center. Dr. Daniels has provided workshops at international conferences, been a Consultant with the National Center for PTSD, and co-chaired for 6 years a PTSD community conference in Honolulu. Her publications include research articles: one in the Journal of Gerontological Social Work and the second in Traumatology. She’s also contributed book chapters in The Handbook of Post-Traumatic Therapy, and Healing War Trauma: Using Creative Approaches. During her non-working life, Dr. Daniels plays a lot of flying disc/Frisbee sports and has competed internationally and all across the US. She has held world titles in women's division events for freestyle (2016, 2013, 2009), double-disc court (2016, 2012, 2009, 2003), and the Women's Overall (multiple games; 2012, 2011, 2010).